I have really been enjoying this podcast, and I'm only sad I'm so far behind! It's a fantastic opportunity to revisit Babylon 5 (and things related) while getting all sorts of different perspectives and points to ponder. Great podcast for B5 fans. The best of the Farpoint Media family. 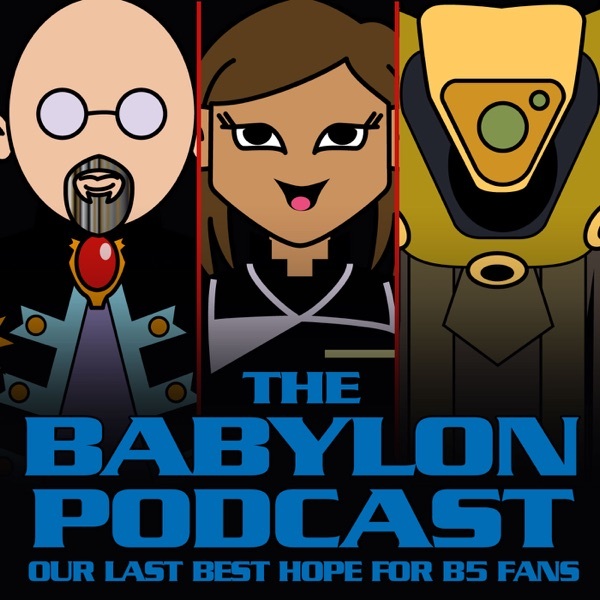 The Babylon Podcast is an excellent source for deep thoughts and fun discussion about Babylon 5. They have had a fantastic array of guests (from JMS himself all the way up to the "Snack Man" you must hear the "Snack Man" interview!). Really, Tim, Summer and Jeffrey do a great job with the interviews. And Tim and Summer dip into deep metaphysical territory when they do Deep Geeking (on every episode of the series), even when they break into laughing fits. An all around great podcast! I am a recent convert to Babylon 5 fandom, and I am working my way through these podcasts. They are very insightful and fun to listen to. Thanks for all the great entertainment, keep up the great work! I love this show! G'Kar is da man!! Informative and very addictive. Great interviews. A must for any fan of Babylon 5. I have just gotten into Babylon 5 and I was so glad to find out there was still a current podcast for the show. They do a great job of keeping a fan community together and still discussing B5 events and episodes. Thanks so much for the podcast! Babylon 5 may have been the last show that I couldn't wait for the recording I had to watch it live. With writing like this I wouldn't use my DVR other than to watch the classic lines from Gkar and Londo over and over again.This podcast gives a great overview of each episode and has had some great interviews. Thanks Summer and all of Farpoint media for a great show. Still Missing B5? This Show is for You. With the release of the new B5 tales on DVD I've really begun missing the show again. When it was on I thought is was the best drama on the air, scifi or no. Tim, Summer, and Jeff really capture the passion and energy that B5 brought to the small screen. It's a comfort to know there's still something new to be said about this landmark show in SF. I must confess, I don't own the DVD's and haven't watched the show in many years. Yet, the crew do a great job of jogging my memory enough with the episode discussions to bring back vivid memories of this great show. Lately, other listeners have been making some great segment contributions to the show creating a new dynamic that keeps the show fresh and unpredictable. So, don't be intimidated - you don't have to be able to quote performance capabilities of a Starfury to enjoy this show. Tune in and check it out! I've listened, to very episode from 1 to present. I like it a lot. I am so glad that the B5 phenomenon lives on in this podcast. Tim, Summer, and the Vorlon do a fantastic job producing the show. I was very disappointed by Warner Bros. and TNT's handling of Crusade and Legend of the Rangers, because B5-related JMS creations really deserve better. I hope this podcast is the first in a revival of interest in the Babylon 5 universe. Keep up the fantastic work! I purchased B5 on DVD and I have had a great time watching the series again after all these years. The Babylon Podcast is a great companion to my endeavor as I can listen to key players from the show while the episodes are fresh in my mind. It is cool to get the inside story from these folks. I agree it would be nice to have more episode specific comments from the players. Maybe we should all get together for a B5 viewing marathon. I'll bring the DVDs and the Babylon Podcast can bring the stars and behind-the-scenes folks to tell their stories and myths. This is a terrific idea. The interviews are interesting, some more than others. The mystery interview concept was cute but has played out, don't you think? Get one of the interviewed to watch an episode important to their contribution just before you call them for the interview. Your quality is good, the clarity is good, you don't talk over each other, you are respectful of each other's opinion. If you can keep up the quality, JMS will be drawn to The Babylon Podcast. We'll all wait until then. <g> Jeffrey, Summer, and Tim, congratulations all around! THANK YOU for this, you guys! Please keep up the great work! A Long in Coming, a welcome B5 Podcast ! This is a great podcast that any B5 fan will enjoy. With interviews with the participants and great episode analysis, it almost makes me want to go and pay for the $89 DVD sets. Almost. I'll just rely on my tapes for now. It's a wonder no one has done it yet, but Tim, Summer and Jeffrey do a magnificent job. I hope to listen to many many more to come.